There’s a Wii U update available for download. It’s unclear whether or not this is the “Summer” update that Nintendo stated would be coming out around this time, but the file size of this download is 648 MB, which is much larger than any typical update. I’m currently updating my Wii U as I type this, but I’m not getting my hopes up because Nintendo likes to discuss and detail something like this before they actually release it. Also, Nintendo stated that there was supposed to be a long maintenance going on right now, and yet the Nintendo Network didn’t go down. This could very well be the major update, but let’s no hold out breathes until we get some kind of confirmation. 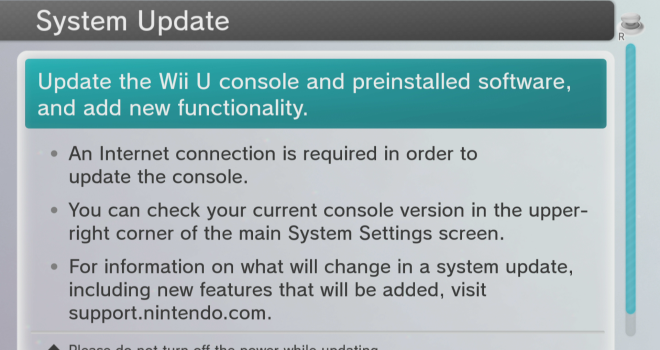 Check back later on and we’ll have updated information regarding the Wii U update. -Upload screens taken when pausing the game directly to blogs and forums using the browser. -Option to receive automatically downloaded software from Nintendo. -View PDFs on the Browser.